Cellular Suspension. A pliable polymer is moulded into cells and loops that provide varying amounts of flex throughout the seat and back. Responsive support. The cells flex and move with the sitter, naturally conforming to shape and movement and properly distributing weight. Aerated comfort. Cellular Suspension lets air pass through so skin temperature stays constant. Superior ergonomics Smooth ride. Celle's Harmonic tilt lets people move naturally and stay balanced. Highly adjustable. Celle has a full complement of adjustments that are easy to locate and use. Inclusive fit. Celle's one chair size fits the 5th percentile female to the 95th percentile male. Meets requirements. Conforms to global codes and standards, allowing for international application. 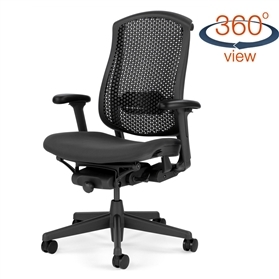 Now with a very comfortable upholstered seat cushion Standard Features: Height adjustable arms Multi-adjustable black arm pads Adjustable lumbar support Adjustable seat depth Graphite base and frame Black Cellular seat and back Comfortable seat pad in Phoenix Havana Black fabric. Tilt limiter with forward tilt.